Use whatever apples you have on hand for this recipe. Preheat oven to 350 degrees. Grease two standard muffin tins. Make the muffins: In a large bowl, combine the flour, spices, baking powder, and salt. Add the apples and toss to combine. 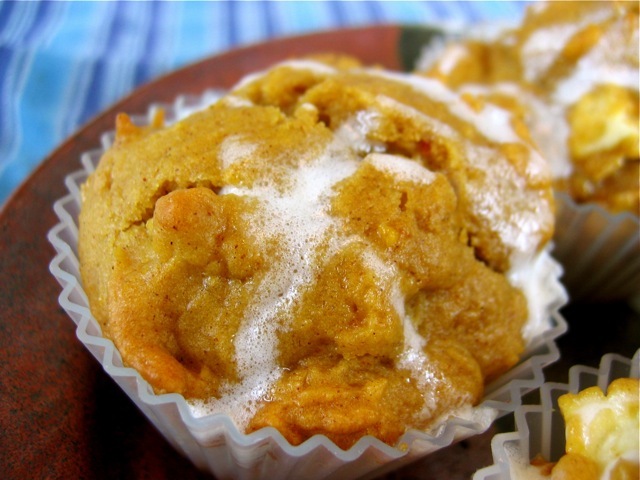 In a separate bowl, combine the sugars, pumpkin, oil, milk or cream, and eggs. Add the wet ingredients to the dry ingredients and stir until just combined. Divide the batter among 18 muffin cups. Bake 20 to 25 minutes, or until a toothpick inserted into the center of a muffin comes out with a few moist crumbs. Set on a wire rack to cool. Make the glaze: Melt the white chocolate in the microwave or over a double boiler. Add the cream cheese and stir vigorously until smooth. Add the milk and stir until combined. Add the confectioners' sugar and stir until smooth. Spoon the glaze over the warm muffins, letting some drip over the sides. Allow the glaze to set before serving, about 15 minutes.